It is with deep sadness that we report today, October 7, 2017, the death of our dear friend William A. “Billy” Spedale. Billy was 84 years old and died of complications from Parkinson’s disease. Billy was a lifelong relic hunter and historian and will be missed by all who knew him. Rest in peace, Billy. Cayenne Civil War Relics proudly presents for sale the lifetime collection of legendary Louisiana Relic Hunter and Historian, William A. “Billy” Spedale, shown below after digging one of his best finds, the extremely rare Louisiana Pelican and Rays buckle. detector he and a hunting buddy pooled their money to buy. Billy says , “ I would hunt one hour and he would dig and then we would switch off.” As the years passed his knowledge of the siege grew with studied research and he was able to plot the camps and positions of every U.S. and C.S. unit. His knowledge led to the publication of several books on Civil War engagements in Louisiana. Two of his books are offered here. Billy has appeared on TV, in newspaper articles, published articles in NSTCW and was very active for years in the Baton Rouge Civil War Roundtable. Billy was also kind enough to write a series of articles for our metal detecting club and they are available for reading on this site. 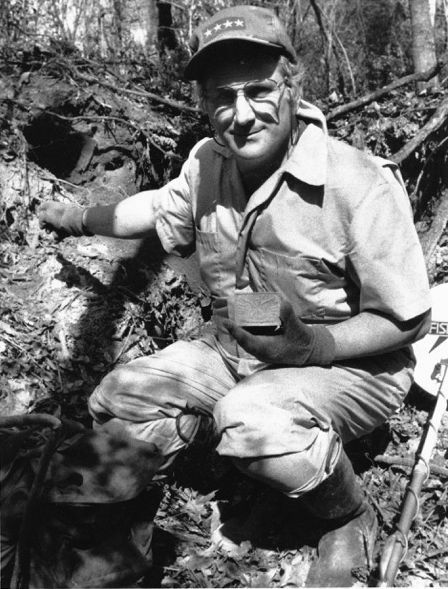 Billy was a pioneer in the golden age of relic hunting, digging relics we can only dream about today and many of his treasures are listed here.